Here is the list of the hotels near Bersée. Book your hotel near Bersée today, Thursday 09 May for the best price, reservation and cancellation free of charge thanks to our partner Booking.com, leader in on-line hotels reservation. Below here is the list the 50 closest hotels of Bersée, sortable according your criteria. You will find the position of these accommodations on the Bersee hotels map. Guest accommodation Le Pavé Preferred hotel ! Located in Mons-en-Pévèle, Le Pave de la Croix Blanche offers a garden and free WiFi. All rooms feature a kitchen and a private bathroom. Rooms come with a terrace with a garden view. Louvre-Lens Museum is 30 km from the property. The rooms in the guest house are fitted with a kettle. All rooms in Le Pave de la Croix Blanche are equipped with a flat-screen TV and a hair dryer. A continental breakfast is served daily at the property. The accommodation offers a sun terrace. A number of activities are offered in the area, such as cycling and hiking. Lille is 20 km from Le Pave de la Croix Blanche, while Arras is 40 km from the property. The nearest airport is Lille Airport, 15 km from the property. Located between Lille and Valenciennes, near the A23 motorway and the airport Lille-Lesquin, Le Manoir, offers hotel accommodation. It boasts free WiFi throughout the property and an on-site restaurant and garden. All rooms at Le Manoir are fitted with a bath or shower and feature a flat-screen TV and phone. The hotel restaurant, Le Manoir, has been a family–run business since 1972 and serves traditional cuisine. Guests have access to a free on-site parking. Boasting air-conditioned accommodation with a terrace, Les Seminades is situated in Coutiches. This holiday home also features free WiFi. This holiday home features a living room and a fully equipped kitchen with a dishwasher and an oven. A flat-screen TV with satellite channels is featured. Guests can relax in the garden at the property. Lille is 29 km from the holiday home, while Arras is 47 km away. The nearest airport is Lille Airport, 28 km from the property. Located 15 minutes from Lille city centre, the Domaine des Cigognes is surrounded by a 4-hectare park with tress, expanses of water and wildlife. A restaurant, meeting rooms and free Wi-Fi are provided on site. Each modern room at the Domaine des Cigognes includes a private bathroom with free toiletries and a shower. A TV and telephone are available in all of the rooms and some are equipped with facilities for guests with reduced mobility. The breakfast is served every morning in the dining room. Providing free newspaper, the property has luggage storage and a safety deposit box. The Domaine des Cigognes is accessible via the A1 motorway, which is a 3-minute drive away. Lille-Lesquin Airport is a 5-minute drive away. Au Paradis des Crins is a holiday home set in the countryside of Templeuve in the Nord-Pas-de-Calais Region and featuring a tree-filled park with a barbecue. The property boasts views of the 1-hectare garden and is 19 km from Lille. Free WiFi is offered throughout the property. The kitchen has a microwave, a toaster and a fridge, as well as a coffee machine. Towels and bed linen are provided in this self-catering accommodation. Free private parking is available at the holiday home. Tournai in Belgium is a 27-drive from Au Paradis des Crins, while Arras is a 16-minute drive away. A number of activities are offered in the area, such as golf, cycling and hiking. An equestrian centre is available just next to the proprerty. The nearest airport is Lille Airport, 9 km from Au Paradis des Crins. Situated in Genech, Gîtes du Montois provides accommodation with a terrace and free WiFi. Guests staying at this holiday home have access to a fully equipped kitchen. This 2-bedroom holiday home includes 1 bathroom equipped with a shower and a hair dryer. A flat-screen TV is featured. The holiday home offers a barbecue. There is a garden at this property and guests can go cycling nearby. Lille is 21 km from Gîtes du Montois, while Kortrijk is 46 km from the property. The nearest airport is Lille Airport, 12 km from the property. Set in Seclin, 10 km from Lille, B&B Hôtel Lille Seclin Unexpo features free WiFi access and free private parking. Each room at this hotel is air conditioned and features a flat-screen TV with cable channels. Rooms are equipped with a private bathroom. Ypres is 36 km from B&B Hôtel Lille Seclin Unexpo, while Arras is 35 km away. Lille Airport is 5 km from the property. Located in Seclin, beside the A1 motorway, which gives direct access from Paris and Lille and 5 minutes from Lille - Lesquin Airport, Foxotel offers free Wi-Fi access. It is a 25-minute drive from the Bollaert Stadium in Lens. Each room has simple décor and is equipped with a flat-screen TV with cable and satellite channels, Canal+ and BeIN Sports. A private bathroom with luxury products is also featured. A buffet breakfast is served daily in the dining area. Restaurants, cafes and a shopping area are located nearby. Guests can have lunch or dinner in a partner restaurant at a reduced rate. Free private parking is provided at the Foxotel. This hotel is 2 km from Seclin Train Station and 9 km from the centre of Lille. Situated in Seclin, a few kilometres south of Lille, this affordable hotel is easily accessible from the E17/A1 motorway and is just a short drive from Lille Lesquin International Airport. Campanile Lille – Seclin offers you affordable accommodation in a convenient and easily accessible location making it a great option for a stopover while travelling through the Nord-Pas de Calais region of France or as a base for visiting the historic city of Lille. The nearby motorway connects you to the city centre in just a few kilometres, while the close proximity to the airport makes the hotel a very convenient place to stay. The hotel features its own restaurant, where you can enjoy a buffet breakfast as well as lunch and dinner. For your convenience, wireless internet access is available free of charge, enabling you to keep in contact with friends and family or business needs. This Premiere Classe hotel is just a 10-minute drive from Lille city centre, 5 km from Lille-Lesquin Airport. It offers en suite rooms with cable TV and daily buffet breakfast. The hotel is 23 km from Stade Bollaert-Delelis and a 15-minute drive from Grand Stade Lille Metropole. Each room at the Premiere Classe Lille Sud – Seclin is also equipped with a desk. Some of them can accommodate guests with reduced mobility. There are on-site vending machine providing snacks and drinks 24/7. Many restaurants are located in the area. The Lille Sud-Seclin also provides daily newspapers. The Premiere Classe Lille Sud is 14 km from Lille Train Station. It easily accessible via the A1 motorway, exit Seclin and free private parking is possible on site. Set in Cysoing in the Nord-Pas-de-Calais region, les Bovrieres has a garden. Guests staying at this bed and breakfast have access to free WiFi. The bed and breakfast consists of 2 separate bedrooms, 1 bathroom, and a seating area. A flat-screen TV is offered. A continental breakfast is served daily at the property. The bed and breakfast offers a terrace. Lille is 17 km from les Bovrieres. The nearest airport is Lille Airport, 12 km from the property. Located 15 km from Villeneuve d’Ascq and from the city of Tournai, La Cense du Pont offers a garden and a terrace. The double rooms have a flat-screen TV and a private bathroom. The rooms are decorated in an elegant style and provide a desk and a wardrobe. The private bathroom is fitted with a shower. A continental breakfast which includes homemade jam is served every morning next to the original fireplace of the breakfast room. Guests can also request a homemade meal. Activities nearby are hiking or swimming in Tournai’s swimming pool. It is located 20 km from Lille and 7 km from Orchies Train Station. Hotel The Originals Lille Sud Bulles by Forgeron is set in a former coaching inn, located 8 km from the centre of Lille. Free WiFi access is provided throughout the property. The guest rooms and suites have been designed by Pollux Architects. All rooms have a private bathroom and some come with a spa bath. A safe, a Nespresso coffee machine and a flat-screen TV with cable channels are provided. Guests will also find a welcome tray. Room service is available. A buffet breakfast is prepared every morning. Hotel The Originals Lille Sud Bulles by Forgeron features 2 restaurants. In 2005, the hotel's gourmet restaurant was named Best Restaurant in Northern France by the Peugeot/Champérard Guide. The chef serves inventive dishes using fresh and local products. The property provides a lift and a free private car park. Lille Europe Train Station and Lille Airport are a 15-minute drive from the property. Located in Sainghin-en-Mélantois, Maison Proche Stade Pierre Mauroy offers accommodation with a terrace and free WiFi. The accommodation is 12 km from Lille. The holiday home has 2 bedrooms and 1 bathroom with a bath. Kortrijk is 37 km from the holiday home, while Tournai is 19 km away. Lille Airport is 9 km from the property. Hotelf1 Douai Flers is located in Flers-en-Escrebieux, 27 km from Lille and 22 km from Arras. Free WiFi access is available throughout the property. All rooms come with a flat-screen TV. All rooms have access to a shared bathroom on each floor. Bed linen is included and guests can purchase microfibre towels at the hotel at an extra cost of EUR 3 each. A free private parking on site is at guests' disposal. Tournai is 33 km from Hotelf1 Douai Flers, while Lens is 15 km from the property. The nearest airport is Lille Airport, 20 km from Hotelf1 Douai Flers. Situated just 2 km from Lille Lesquin Airport and 7 km from the city centre, this hotel offers comfortable suites and free Wi-Fi access. The spacious suites at ibis Styles Lille Aéroport are decorated in bright, contemporary colours. They come with a TV, private bathroom and work desk. The large windows offer plenty of natural light. Every morning a buffet breakfast is served at ibis Styles Lille Aéroport. Guests can enjoy a drink in the hotel bar and there are vending machines selling snacks and beverages. There is an airport shuttle service during the week and free private parking is available on site. Fasthotel Lille Aéroport Lesquin offers affordable rooms with free Wi-Fi and flat-screen TV with satellite channels. It is located just a few minutes from Lille-Lesquin Airport. The hotel is also in close proximity to the Zenith concert hall and Lille city centre. Guest rooms at the Fasthotel Lille Aéroport Lesquin are all equipped with a private shower and a telephone. Additional services include a daily buffet breakfast. Traditional cuisine can be enjoyed at a partner restaurant located nearby. Guest accommodation Sainghin-en-Mélantois Preferred hotel ! Located 8 km from the centre of Lille, Gîtes la Verdière offers self-catering accommodation with a garden, terrace and free WiFi access. The 3-bedroom house has a seating area and a kitchen. There is a private bathroom with a bath and towels and bed linen are provided. Private parking is also available on site. The nearest airport is Lille Airport, 4 km from the property. Boasting barbecue facilities, B&B MycolorHouse is located in Douai and is 1.3 km from Ecole des Mines de Duai. The property features a garden, as well as a terrace. The accommodation features free WiFi throughout the property. The rooms in the bed and breakfast are fitted with a flat-screen TV. B&B MycolorHouse provides certain units with garden views, and the rooms include a shared bathroom. All guest rooms will provide guests with a microwave. A continental breakfast is served daily on the veranda at the property. Douai Hospital is 1.9 km from the accommodation. The nearest airport is Lille Airport, 21 km from the property. Douai train station is a 6-minute drive away and free pick-up from there can be arranged. A private secured parking with an electric charging station is available upon request. This Mercure hotel is located next to the Lille Lesquin airport, a 10-minute drive from Pierre Mauroy Stadium and the centre of Lille, while the Eurostar Train Station is a 15-minute drive away. Guests have free access to a sauna and a fitness centre. Guests staying at the hotel will appreciate the free shuttle bus service to and from the airport. It runs from 05:00 to 23:00. Mercure Lille Aéroport features spacious and functional guest rooms that provide a comfortable living space. Every room is air-conditioned and features satellite TV and free Wi-Fi internet access. Also inside the hotel, guests will find 2 restaurants and 1 bar. Choose from traditional and regional French cuisine or from a brasserie menu. The bar, La Lanterne, serves snacks and provides musical entertainment. Other hotel facilities include private parking. The hotel also offers the largest meeting room capacity in the north of Paris. The ibis Styles Douai Gare Gayant Expo is located in Douai, near the train station and opposite the Gayant Exposition Centre. It offers rooms with flat-screen TV with satellite channels, and is 25 km from the Stade Bollaert-Delelis in Lens. The restaurant at ibis Styles Douai Gare Gayant Expo serves traditional, seasonal cuisine. A fine selection of wines is also available. The English-style bar offers a selection of wines, whiskies and local beers. The ibis Styles Douai Gare Gayant Expo offers a 24-hour reception and room service. Ideal for a leisure or business stay, the hotel is situated 5 minutes from Lille Lesquin Airport and 10 minutes from the city centre. It offers spacious and modern accommodation. The restaurant, Novotel Café, serves tasty and healthy cuisine 24 hours a day in a cosy setting. A terrace is also available. Novotel Lille Aéroport features free on-site parking and a free shuttle service to the airport. Charging stations for electric cars are available at this property. For your entertainment, you will find a fitness centre and an outdoor swimming pool on-site. The property is 7 km from Lille Grand Palais and 6 km from the Pierre Mauroy Stadium. The Hotel Agena is located in a quiet location in the suburbs of Lille, near many restaurants and a shopping center. Choose among 40 rooms, with all the modern amenities you may need during your business or leisure trip. Located near the express way, the hotel also boasts a free secured car park and a bar, making it the perfect place for a stopover. Breakfast is served every morning and includes brioche, jam, bread and homemade cake. Boasting accommodation with a terrace, Gîte Noir Lapin is situated in Lesquin. Guests staying at this holiday home have access to free WiFi and a fully equipped kitchen. Offering 2 bedrooms and 2 bathrooms, this holiday home features a flat-screen TV with cable channels and DVD player. A continental breakfast is available every morning at the property. Lille is 8 km from the holiday home, while Ypres is 39 km away. The nearest airport is Lille Airport, 2.7 km from Gîte Noir Lapin. Maison de Charme - Campagne proche de Lille is a holiday home set in Sainghin en Mélantois, 9 km from Lille and 35 km from Ypres. The kitchen has a dishwasher, an oven and a toaster, as well as a coffee machine. A TV is available. Other facilities at Maison de Charme - Campagne proche de Lille include a terrace. Arras is 44 km from Maison de Charme - Campagne proche de Lille, while Kortrijk is 27 km from the property. An array of activities are offered in the area, such as cycling and hiking. The nearest airport is Lille Airport, 5 km from the property. Apartment Douai Preferred hotel ! Neoresid - Résidence Republique enjoys a location in Douai, just 1.8 km from Ecole des Mines de Douai and 2.8 km from IUFM Douai. The property, housed in a building dating from 2008, features free WiFi. The apartment features 1 bedroom, a living room, and a kitchenette with a dining area. The property also has 1 bathroom with a shower. Arkéos Archaeological Park is 6 km from the apartment. Lille Airport is 34 km away. Featuring free WiFi throughout the property, Hotel de Warenghien offers accommodation in Douai, a 5-minute walk from Douai Train Station. Free private parking is available on site. Certain rooms feature a seating area to relax in after a busy day. Some rooms include views of the garden or city. A flat-screen TV is featured. Ecole des Mines de Duai is 1.5 km from Hotel de Warenghien, while IUFM Douai is 2.6 km from the property. Lille Airport is 22 km away. 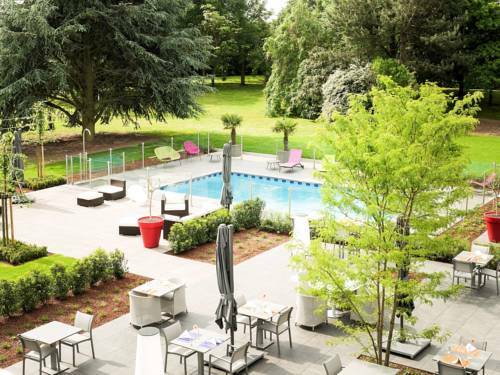 Located in Cuincy, just 2 km from Douai, this 3-star hotel features a terrace. It provides accommodations with free WiFi, decorated in a contemporary style. This Campanile hotel has 50 rooms, all with a desk, a TV and coffee and tea facilities. Each room also includes a private bathroom with a bath or a shower. A buffet breakfast with fresh fruit and pastries is served each morning. Campanile Douai Cuincy also has an on-site restaurant, offering traditional dishes from the region. Free parking is also available on site and Lille is 30 km from the hotel. Situated in Douai, within 2.4 km of Ecole des Mines de Douai and 3.3 km of IUFM Douai, Apparthotel Douai Gare offers accommodation with free WiFi. All units feature a flat-screen TV, a private bathroom and a fully equipped kitchenette. The aparthotel offers a terrace. Arkéos Archaeological Park is 6 km from Apparthotel Douai Gare. Lille Airport is 34 km from the property. Les V elements provides accommodation in Dourges. With free bikes, the property also has a fitness centre, as well as barbecue facilities. Guests can enjoy garden views. All units come with a flat-screen TV with satellite channels, a coffee machine, a shower, free toiletries and a desk. With a private bathroom, rooms at the guest house also provide guests with free WiFi. All guest rooms have a wardrobe. A continental breakfast is served every morning at the property. A variety of popular activities are available in the area around the property, including cycling and hiking. Lille is 27 km from Les V elements, while Arras is 27 km from the property. The nearest airport is Lille Airport, 22 km from the property. Located 20 km from Stade Bollaert-Delelis, Premiere Classe Douai Cuincy offers a relaxing and warm place to stay that boasts an ideal location to discover Douai, city of art and history, the Nord-Pas-de-Calais and enjoy successful professional events. The hotel’s 72 rooms provide genuine comfort in order to make your stay as pleasant as possible. All the rooms are equipped with a working area, a private shower and a TV with cable channels. A buffet breakfast is served every morning from 06:30 to 10:00 during weekdays and from 07:00to 10:00 during the weekend and public holidays. B&B Hôtel Douai Parc Des Expos Cuincy offers pet-friendly accommodation in Cuincy. Free private parking is available on site. Rooms at the B&B Hôtel Douai Parc Des Expos Cuincy are air conditioned and come with unlimited free WiFi, comfortable bedding, a private bathroom and a flat-screen TV with satellite channels. Lille is 28 km from B&B Hôtel Douai Parc Des Expos Cuincy, while Arras is 22 km away. Lille Airport is 21 km from the property. ÔH MY HÔTE is located in Wattignies, 6 km from Lille. Free WiFi is available. All rooms feature a hot tub and have bath robes and slippers. Certain rooms include a seating area to relax in after a busy day. You will find a coffee machine and a kettle in the room. For your comfort, you will find free toiletries and a hair dryer. A flat-screen TV is provided. You will find room service at the property. Ypres is 32 km from ÔH MY HÔTE, while Arras is 38 km away. The nearest airport is Lille Airport, 4 km from ÔH MY HÔTE. With a 24-hour front desk, Parc Hôtel is a 9-minute walk from the centre of Carvin and 12 km from Lens. It offers a garden, a terrace and rooms with a flat-screen TV. Free Wi-Fi access is provided. All rooms feature carpeted floors, a desk and a private bathroom with a shower. Some are suitable for guests with reduced mobility. A buffet breakfast is served every morning at Parc Hôtel and it can be enjoyed in the comfort of the guest rooms. Guests are able to enjoy traditional dishes at the hotel’s restaurant before having a drink at the bar. This property is 13 km from Thumeries Golf Course and 25 km from Lille. The Belgium border is 31 km away and free private parking is available. Hôtel du Grand Cerf is located in the heart of Douai, 500 metres from the train station. Decorated in a modern and colorful style, the accommodation features soundproofed rooms with free Wi-Fi access, a satellite TV and a view of the city. The private bathroom comes with a shower or a bathtub. Extras include a desk and bed linen. A buffet breakfast with fresh bread, French pastries, fruit salad and fresh fruits is prepared daily. The hotel is 1 km from Douai Hospital and 1.3 km from Ecole des Mines de Duai. Lille Airport is 22 km away. Free public parking is available. Hotel The Originals Douai Le Gayant (ex Inter-Hotel) welcomes you to the welcoming city of Douai, a place made famous by its belfry and its giants. Hotel The Originals Douai Le Gayant boasts modern, full-equipped rooms with cable television and a full bathroom. For your convenience, a free public car park and a private car park are available. Enjoy a friendly welcome in a cosy atmosphere. The hotel's bar is the ideal place for a relaxing drink among friends after an hectic day of work in the seminar rooms. Business travelers can benefit from a special partnership between the hotel and a nearby restaurant. Located on the river Scarpe, some 40 kilometres from Lille and 25 kilometres from Arras, Douai is home to one of the region's most impressive belfries. Located in Douai, the hotel La Terrasse welcomes you for a gastronomic stay, in a very sophisticated frame. The hotel has 17 rooms. They have bathrooms with shower or bathtub, toilets, satellite television, radio alarm clock, telephone as well as a minibar. The hotel features a famous gastronomic restaurant. Rivage Saint-Jacques Apartment is a self-catering apartment located in central Douai, just 1 km from Douai Train Station. Free WiFi access is available and the property is 800 metres from Ecole des Mines de Duai. Set on the ground floor, this elegant apartment will provide you with an iPod dock, radio and a seating area. Hardwood floors, original fireplaces and modern furniture feature in this apartment. The kitchen is equipped with a microwave, fridge and an oven. The private bathroom also comes with a hairdryer. The towns of Arras and Lens are less than 25 minutes away by car, and free public parking is available nearby. Located in the heart of Noyelles Godault, this attractive hotel offers a competent service in a comfortable and quiet setting. Enjoy the comfort of 44 renovated rooms with flat-screen television, cable channels and wireless internet access. Seminar rooms for up to 120 people are also available to accommodate all your special events. The Cap Hotel also prides itself on the quality of its cuisine which you can enjoy as a all-you-can-eat buffet. Special menus are available for social events, weddings, etc. Ideally located 10 minutes from Lens and Douai and 20 minutes from Lille, Roubaix and Arras, Cap Hotel is easily accessible via the A1 A21 motorways, making it the perfect base for your next special occasion. Comfort Hotel Lens - Noyelles Godault is situated 500 metres from the centre of Noyelles-Godault, the train station and just 20 kilometres from Lille airport. The hotel is 15 km from the Stade Bollaert-Delelis. Guestrooms are comfortable and well-equipped with modern en suite facilities. They provide a functional living space for your stopover or short stay in the area. All rooms offer TV Canal+ and Canal Satellite and free WiFi internet access. Located in the centre of Douai, this hotel offers modern guest rooms with an LCD TV and free WiFi access. You can enjoy the 24-hour bar and Douai Train Station is only 1.5 km away. Each of the guest rooms is decorated with parquet flooring and wooden furnishings. The private bathrooms are fitted with a shower and they include a hairdryer. A buffet breakfast composed of sweet and savoury dishes such as eggs, fruit salad, yogurts and juices is served every day. Pastries baked on site and fresh French Madeleine cakes are also on offer, as well as a hot beverage and a piece of fruit to take away. Outside of regular breakfast hours guests can also enjoy a lighter option, available from 04:00. With a 24-hour reception, this hotel also has newspapers a web corner and luggage storage is possible. Free private parking is available on site and Lille Airport is located 30 km from this hotel. Saint Jacques de Douai Church is only 450 metres away. Chambres d'Hôtes Les Foulons is a guest house built in a private mansion of the 17th century with a garden and 2 terraces. The elegant rooms include a flat-screen TV, a fireplace and wooden furniture. The rooms of Les Foulons are decorated in a traditional style and have high ceilings. All of the bathrooms have free toiletries, a bathrobe and a hairdryer. Guests will enjoy the continental breakfast served every morning. After breakfast, you can rest in the garden or on the terrace enjoying the free Wi-Fi access available everywhere. Chambres d'Hôtes Les Foulons is situated 2 km from Douai Train Station. The tourism office is located 350 metres away and the Douai Bell Tower is only a 3-minute walk from the guest house. B&B Hôtel LENS Noyelles-Godault is located in Noyelles-Godault. This 2-star hotel has air-conditioned rooms with a private bathroom. Free WiFi is featured. All units in the hotel are equipped with a flat-screen TV. Guest rooms have a desk. A buffet breakfast can be enjoyed at the property. Lille is 30 km from B&B Hôtel LENS Noyelles-Godault, while Arras is 24 km away. Lille Airport is 25 km from the property. This Premiere Classe is located in the outskirts of Noyelles-Godault, 2 minutes from the A1/E17 motorway. It offers en suite guest rooms with satellite TV and free Wi-Fi access. The Stade Bollaert-Delelis is 15 km away. The Premiere Classe Henin Beaumont also provides free on-site parking. A buffet breakfast can be enjoyed every morning at Premiere Classe Henin Beaumont –Noyelles Godault. Guests of the Henin Beaumont - Noyelles Godault can access central Lens in 15 minutes by car and Lille is 30 km from the hotel. The A1 motorway is 100 metres away. Ace Hotel Noyelles is located in Noyelles Godault, only 17 minutes' drive from Stade Bollaert and 20 minutes' drive from Lille. It has close access to motorway A1, A21 and N43 and offers free WiFi access. Each soundproofed room at the Ace Hotel is equipped with satellite TV, air conditioning and a private bathroom. Guests can enjoy a buffet breakfast which is served everyday in the dining room. A number of restaurants can be reached within walking distance. Additional facilities include a 24-hour front desk, free private parking and an elevator that takes guests to their rooms. Ace hotel is located only 5 minutes from Hénin Beaumont city centres and 20 kilometres from Arras. The nearest airport is Lille Lesquin Airport, 20 minutes' drive away. Located a 16-minute drive from Arras and a 25-minute drive from both Lille and Douai, Fasthotel offers modern accommodation with free Wi-Fi access and free on-site parking. A buffet breakfast is prepared every morning and the Stade Bollaert-Delelis is 15 km away. Guest rooms each have a private bathroom and a TV with Canal+ and beIN Sports channels. A buffet breakfast is served each morning. Guests can benefit from reduced rates at the hotel's partner restaurant which is located a 2-minute walk away and is open 7 days a week. A 24-hour automatic check-in machine is available and a large shopping centre can be found just a 2-minute drive away. The hotel is accessible from the A1, A21 and A26 motorways. Hotel Noyelles-Godault Preferred hotel ! Hotel Cerise Lens is located a few minutes from the A1/E17 motorway in Noyelles-Godault, a 15 minute drive from Lens city centre. It is a 17 minute-drive from Bollaert-Delelis Stadium and a 25-minute drive from Louvre-Lens Art Museum. It offers soundproofed guest rooms, each with a private bathroom, LCD TV with Canal+ channel and free WiFi. The hotel serves a buffet breakfast every morning in the dining room. You can also dine at one of the nearby partner restaurants, reserve a meal basket on-site or order delivery to be enjoyed in the comfort of your own room. Vending machines with drinks and snacks are also available for guests' convenience. Free private parking is available at the Hotel Cerise Lens and Lille city centre can be accessed in 40 minutes by car. Situated a 15-minute drive from Lens and Arras, and a 25-minute from Lille, Novotel Lens Noyelles is set in a verdant park at the junction of the A1, A21 and A26 motorways. The Stade Bollaert-Delelis is located 14 km away. The hotel Novotel Lens Noyelles features 81 spacious and air-conditioned rooms providing functional accommodation and spacious spaces. There are 4 on-site meetings rooms for up to 150 people and a lovely outdoor swimming pool. The restaurant Novotel Café serves tasty and healthy cuisine in a cosy setting 24 hours a day. In the summertime, you can have your meals on the terrace. Up to 2 children (15 years and under) stay free when sharing with parents. Guest accommodation Villeneuve d'Ascq Preferred hotel ! Located an 8-minute drive from Lille City Centre and a 5-minute drive from Pierre Mauroy Stadium, this residence with 24-hour reception features centenary olive trees and offers design apartments with free Wi-Fi and satellite TV. Lille-Lesquin Airport is 5 minutes away. Each design apartment has a kitchenette equipped with a fridge, electric kettle and microwave. Olivarius Apart Hotel Lille Villeneuve D'ascq apartments also have a contemporary, private bathroom. A varied buffet breakfast including homemade pancakes is served daily. There is also a café, a 24-hour snack shop and a lounge bar. You can also admire the 100-year-old olive trees in the 700m²-atrium. Free, secure parking is available on site or you can rent a private garage. The residence is accessible via the A27 motorway. Below here is the hotels map of Bersée. Names and details of Bersée hotels can be shown on the map clicking on the prices icons.